Ah, it's finally complete! Here's what I'm sending off to my Four Seasons Quilt Swap partner for the Spring themed quilt. Originally I wanted to make a Strips 'n Curves quilt, but I just didn't have the required variety of fabrics in my stash to do that justice. And once I mastered making these little fabric origami flowers I just couldn't stop. They're popping up everywhere in my projects lately. Since they add the oomph I kept the actual quilt design simple with a classic checkerboard on point. 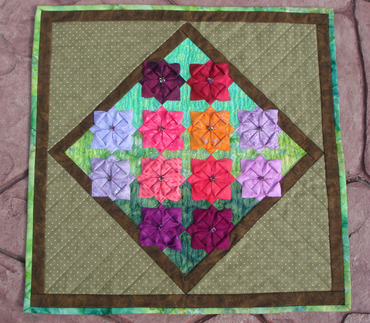 I love how the flowers turn the green squares into X's once they were opened and tacked down. A detail shot of the flowers. I used the directions from Rebecca Wat's book, Fantastic Fabric Folding. They needed a little something for the centers so I added a wee bit of bead soup in purples and greens. Hmm, those same colors again! I guess that I'll just have to continue with those colors until I get another color obsession. My only regret is that I was late in sending this out to my swap partner. Many apologies to her and to Margaret, the swap hostess, who has once again hosted a lovely quilt swap. 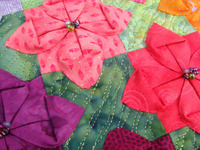 Just take a look at all the beautiful quilts that were created to celebrate Spring at the Four Seasons Quilt Swap flickr pool.